From this it can be seen that fencers were to show restraint in the training school and use their weapons with caution, so that serious wounds would not occur. In the Fechtschulen, however, such wounds were often required to obtain a prize. For the sake of simplicity, a rule had been introduced for the larger public fencing displays that a prize would be granted to the one who had inflicted a bleeding wound on the head of his opponent. On the one hand extensive rules of combat could be avoided, on the other hand, agreements between the fencers would be circumvented. The wound was decisive and could not be hidden; this avoided troublesome amounts of writing, of which people were not very fond at that time. How simple this requirement was in comparison with the regulations for prize fencing today! How frequently hits are denied today, how attentive the judges must be not to miss any movement, and how complex prize and exhibition fencing is at the present, with its many paragraphs and points and evaluative marks. As mentioned above, it is possible that competitions on foot took place very early; the first descriptions are found in the 16th century. While the two fencing societies of the Marxbrüder and the Federfechter were teaching accomplished fencers in every German city using trained masters, virtuosi of the art of fencing were traveling from city to city holding exhibition fights in which the best fencers could show their skills. All presentations in the area of fighting ability were followed with the greatest attention, and the whole populace took a lively interest in the flowering of the art of defence. 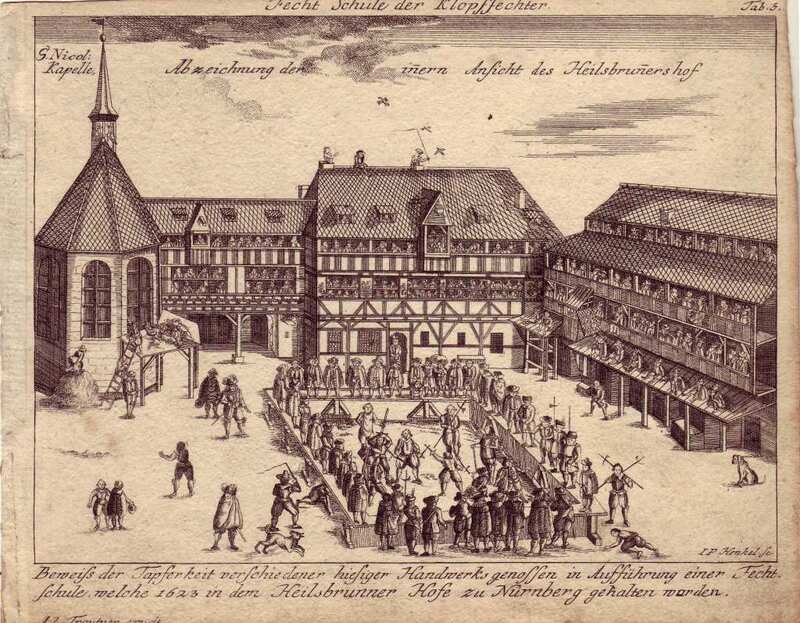 It can be seen from a manuscript of the Germanic National Museum in Nuremberg, “Fechtschul Rhymes,” that in 1579, for example, a Fechtschule was held every Sunday from 26 April to 4 October; so there must have been not only a sufficient number of fencers, but also quite a large circle of onlookers to cover the cost with the entrance fees. Generally these Fechtschulen were held in innyards, in the Egidierhof, in the Heilsbrunnerhof, and in the Golden Star, until the Fencing House was built in 1628. A fencing-master who wanted to give a “fencing school” first had to demonstrate his qualification as master of the sword with the municipal council of the city in question and apply to be granted the use of an open space for the purpose. If permission was granted and the day and hour set, then he could proclaim his intentions at the city’s Rathaus by posting a notice. On this notice the letter of privilege of the Marxbrüder was generally printed—if the fencing-master belonged to that society—and the Free Fencers of the Feder were invited to appear in force to measure themselves against the Marxbrüder. Although the Federfechter obtained their first letter of privilege from Rudolph II in 1607, this society had been acknowledged as of equal standing long ago, and their masters of the sword could also obtain permission from the city authorities, even though the Marxbrüderschaft did everything in its power to make their fencing schools impossible, because they encroached upon their privileges. A fair Sunday morning has dawned. Everyone is getting ready to go to church, to which the bells are solemnly summoning them. The streets are animated, young and old in festive garments make haste to do their duty and then to have something to eat. The best is saved for last, the real, genuine Sunday treat: the Fechtschule. The whole city has been looking forward to it for a week, since everybody knows someone in it, some a brother or a son, some a husband or a friend. And so after mass, all the streets and squares are full; the young lads can hardly wait for the moment when the procession goes by. It is spring, the sap has risen in the trees, blossoming branches hang down into the streets. And as the gnarled branches feel that it is time to stretch, to expand and to grow, so too the young people are driven outdoors by a feeling of strength; they want to measure themselves against one another in combat. The birds sing their spring greeting from the branches into the blue air, the girls walk up and down in threes in front of the houses, giggling and waiting for their friends and neighbors. Everyone, everyone is lingering in the streets, for soon the players are to come by as the head of the procession of fencers which the onlookers will join. But anyone who wants to have a good place has to go on ahead. Finally, the familiar melody of the city cornet players rings out from the Rathaus tower, and immediately drumbeats and piping are heard. There they are already! The boys greet them with yells of delight. First, the constable of the council, and the groundsmen with leather Dussacken, then the players and a troop of fencers, then a young boy with the parade sword, then a grey-bearded servant with a red velvet bag, heavy and well-filled, which a patron of the one holding the fencing school, a count living nearby, has sent so that prizes of two gulden can be given to the victors for inflicting a wound. Behind him, the fencing-master paces proudly, the image of strength and agility. Then, another procession of fencers and finally the servants who are carrying the fencing weapons. All find themselves in the midst of a swarm of boys who run ahead of the procession and then allow it to pass by them again—now imitating the powerful steps of the greybeard, now mocking their acquaintances who are passing by so solemnly, teasing one, pulling another by the doublet, singing mocking verses about those who hesitate, overflowing with youthful high spirits. The groundsmen had already had to intervene a few times because the procession was being held up by the boys, i.e. they had taken their leather Dussacken in their hands and made as if to strike out with them—but where were the boys now? Far ahead! A festive mood everywhere, lifted by the colorful garments of the holiday and the clear blue sky, and in no way clouded by the fact that three surgeons with the tools of their trade have joined the procession and hope to earn good money today. Meanwhile the procession has reached the appointed place. A large courtyard strewn with sand, surrounded on three sides by spacious buildings and closed off on the fourth by a board fence, behind which the boys’ heads can be seen; they have already taken possession of their ancestral free seats. They peer over curiously; sometimes one of the tow-headed lads vanishes—he had to give way to a stronger who now occupies the empty space. The city council, a few exalted personages and “all womanhood” sit on chairs and benches which have been set up in the broad curves of the pathways, while the populace, who paid little or nothing, takes up a position behind stretched-out ropes. The city constables stand alongside. A drumroll resounds, the servants carry the weapons into the space and spread them out on the ground according to the master’s directions, and he takes up an ornately decorated staff, the sign of his standing. He swings the staff around his head and walks all around the space, passing by the council members; he bows deeply, then when he reaches the middle he stretches out his sinewy form, leaps back and forth, threatens with the staff and shows the agility of his body. So then, let all good fellows who are here present and have learned the knightly art of fence and are experienced in it, and who intend to bring joy and entertainment with due submission to the high-born gentlemen, the honorable company of knights and all the ladies with their skill, come forward unhindered to fight for the established prize, to keep the fitting passages of arms according to the honorable ancient custom of fencing. And I am minded and determined to keep myself unprejudiced towards all such good fellows, as befits an honor-loving master of the longsword, and to guard and protect them against and in opposition to arrogance and impropriety. “Yet all men should know what is to be forbidden in this fencing school, such as Ort, button, point, Einlauff , breaking of an arm, violent push, reaching for the eyes, stone-throwing and all dishonorable devices which many no doubt know how to use, but I cannot mention them all, and have never learned them; and let no one strike either above or below the staves. Guard and protection is to be extended to each, as well as to all the rest, and likewise I wish to request that if two of you bear hatred and envy towards one another you will not fight it out in this school, but where it has power and might. This long opening was supported by drumbeats during the important sections. Thereafter, at the repeated urging of the fencing master, young apprentices and also men of more advanced years come onto the field, put aside their cloaks, hats and weapons, and some also the outer doublet, and pick up some fencing weapon from the ground as they await an opponent. But none of them wants to start; it is not hesitation or lack of courage—only that no one wants to be first. Around the holder of the Fechtschule, who is a master of the longsword of the brotherhood of St. Mark, twenty Marxbrüder have gathered from the town and its surroundings, who wish to “offer their points” to the free fencers of the Feder; but since twenty-six Federfechter are present, so that they would have an advantage over the twenty Marxbrüder, after a short conference three Federfechter go over to the Marxbrüder to make the numbers equal. Since no one has yet come forward, they “freshen” themselves for the combat with taunting rhymes, either sung or spoken. These taunting rhymes, as far as their content is concerned, understandably move within narrow confines; with almost identical expressions one’s own brotherhood is exalted to the skies and the opposing company is damned, or general remarks on swordsmanship, courage and other topics are repeated in bad verses. After this, a beginning had to be made; the honor of the two fencing societies required it, and two stepped forward with longswords, just in front of the place where the council members were sitting: the Federfechter a young man with curly blond hair, tall and slender, and the Marxbruder, an older, powerful fellow with dark hair and a stocky figure, the former nimble and swift, the latter reflective, but not slow. Scarcely had the Marxbruder taken up his stance in the rechter Ochs when the Federfechter struck a blow from the rechter Zorn, which the former countered with a Zwirch. But the Federfechter follows up swiftly from the Tag, while the sturdy Marxbruder drives up at the fists of his opponent with the heart of his blade, thereby weakening the stroke, pushing the man back and adding a long stroke which the blond fencer eludes by a powerful leap backwards. There is clamorous applause after this bout, which is fought with great rapidity. Encouraged by this, the Federfechter presses his counterpart with the “defensive stroke.” The other takes up the stroke on the long blade and simultaneously strikes with the short blade with a Zutritt, so that the point hits the head and the first bloody cut can be “confirmed” by the fencing master, who immediately stretches out his staff between the two. The blond man, for whom the first rote plume has blossomed, leaves the Fechtschule area through a small side door, accompanied by a boy, and enters a spacious room where the surgeons have already made all necessary preparations to meet the challenges which will confront their skill. While the Federfechter meditated on his misfortune in the surgeons’ room and regretted his overhasty ardor, the Marxbruder outside had received shouts of acclamation, the ladies had thrown a small wreath down to him, and the greybeard with the red silk bag had approached him solemnly and handed him the first four silver gulden, which he tucked away in his belt after a brief expression of thanks as money well-earned. After the first pair, who fought alone, several pairs stepped forward simultaneously, this time with different weapons. Two with long staves excited general attention by the skill with which they handled these long weapons, sometimes laying them on the left shoulder, sometimes letting them sink to the ground, striking swift blows, skilfully directing those which bore powerfully down on them to the forte and deflecting them. Finally, one of them was careless and suffered a bump and a small bleeding cut just over the right eye, which earned his opponent two gulden; he followed the path which the first loser had taken. The fights with Dussacken were lively, long-lasting and the most numerous, largely because there was no immediate danger of death. For the opposite reason, swordfights were rarer. The fencing master and some Vorfechter, also equipped with staves, had their hands full separating heated fencers, who immediately stopped fighting when the staff was stretched between them. Even if it sometimes may have happened that the fencing master held out his staff to favor someone when it was not strictly necessary to protect him, but only to prevent the other from seizing the advantage, yet the proceedings seem always to have been conducted with great exactness and justice. The surgeons’ room was full by now. Fencers wounded by the sword had their heads bandaged and were sitting on a bench against the long wall, while the Dussack fencers “had great rising stripes on their faces and heads, so that at times they looked unrecognizable,” covered their lumps with damp cloths and thronged together in a corner. Two of the latter were already prepared to reenter the lists, and were just discussing how they planned to be victorious this time. “Was sehrt, das lehrt,” as the proverb so rightly says. 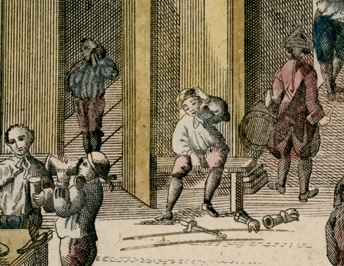 A continual change in fencers kept the onlookers in a state of perpetual tension. There was particular applause for two Dussack fencers who made twelve passes without either of them being beaten, which of course did not cause the red bag to open in sympathy. But it had to pay out the promised prize without any battle to a giant, as tall as a tree, who stood there with his halberd and found no opponents. Suddenly there was a commotion. A furrier’s apprentice had offended against a prohibition by recklessly thrusting the pommel of his sword into his opponent’s face. The fencing master took the sword from his hand and by throwing it down at his feet forbade him from taking up any weapon at all. The one who was publicly branded in this way crept away and was “soundly thrashed” in the gateway by some Federfechter and their relatives who had followed him [note: word for word according to the fencing-school rhymes of 1579], which of course was used by the furrier’s friends as an excuse to join in. The fistfight might have drawn even more people in if the groundsmen had not competely cleared the space with their leather Dussacken in a few seconds. They struck out without mercy wherever they could find a mark, and people naturally withdrew from these blows, which were painful but not dangerous, inflicting only disgrace and mockery, with suitable rapidity. Finally, after the greybeard’s bag has been emptied, the fencing master steps forward, in order to execute some bouts with one or two who might wish to do so, as he had already mentioned at the opening of the school. He takes up a sword and gives his staff to one of the champions. A counterpart steps forward and faces the master, who initially tempts him forward by weak counterstrokes and hesitant attack and would certainly have done him some harm if the champion had not “brought down” the staff and ended the fight. A second and third opponent fare no better in Dussack fighting, and only the fourth gained the advantage over him in the rapier, because he was already overtired. The fencing arena has been cleared, the guests are departing, and the wounded, who have waited for the end, also creep towards their homes by sidestreets. But the victors and those who are not too badly wounded gather around a table set up in the courtyard to recover from the exertions of the day and to refresh their thirsty throats. “The one who is lucky will sing in the evening,” so says one of the Fechtschul rhymes, and indeed cheerful song rings out, given a higher blessing by the innkeeper’s message that the exalted patron has donated a keg of beer. This passage was translated by Ann Martin, PhD from Schmied-Kowarzik, Josef and Kufahl, Hans Fechtbüchlein, Leipzig: Reclam, 1894 and is taken from J. Christoph Amberger’s European martial arts classic, The Secret History of the Sword: Adventures in Ancient Martial Arts. Purchase it at Amazon.com today! videos w/ Paladin Press and some nice royality checks have made it worthwhile. It is so nice to do what I want too and say to hell with anyone who does not like it….Hurrah for the Ole Guys. Good luck. If I had a buck for each time I came to fechtschule.wordpress.com! Incredible read. If only more than 78 people would hear this.